I actually wanted to recommend both of you to try a new Thai restaurant that opened up less than an year ago on Granville. It’s right next to Rogers and took over a Japanese restaurant that used to be there. 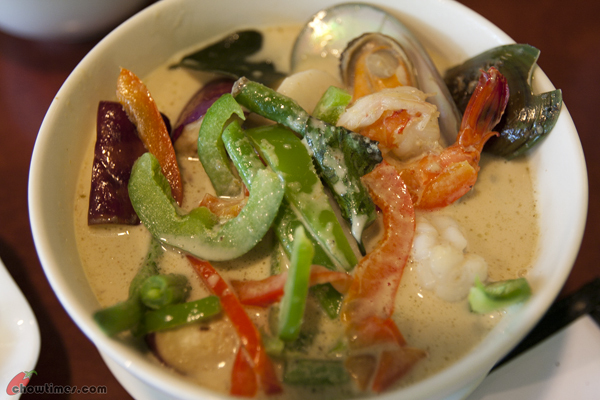 It’s called Talay Thai and it’s down to earth, authentic Thai food. 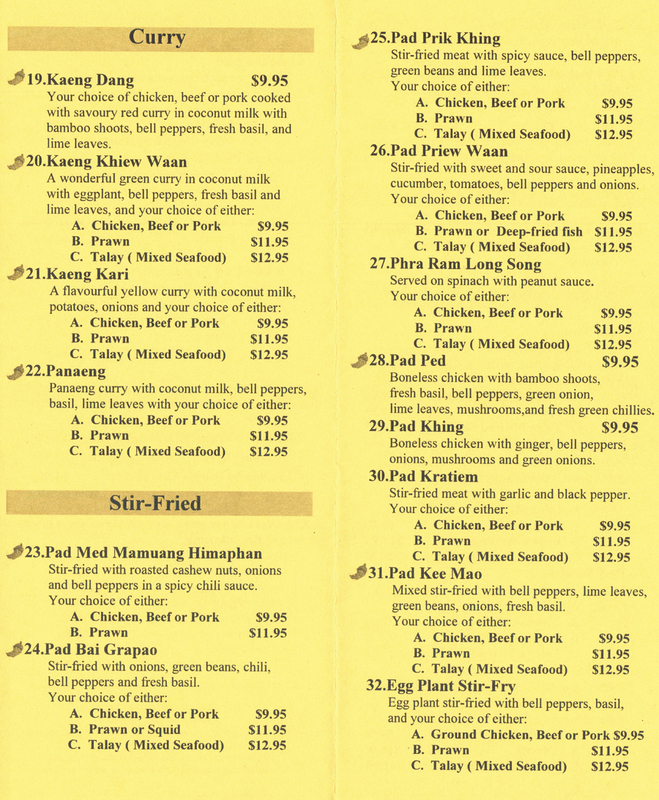 The owner, cooking staff, and waitresses are all Thai. 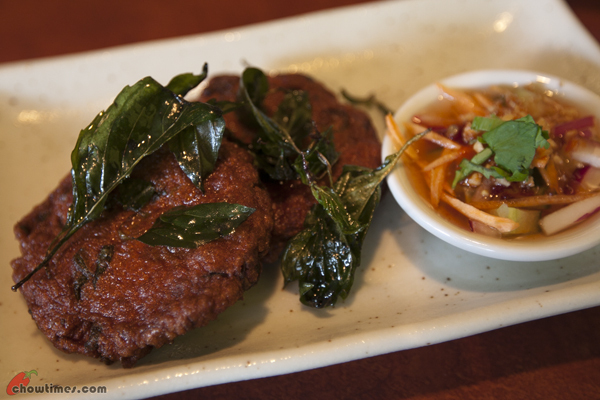 Their food is very well flavoured and it’s a great place to have authentic Thai food in a casual setting. My best friend and I discovered this place while doing our regular restaurant scouting missions haha. Because I’ve only gone there twice, I haven’t tried much, but what I can recommend is their green curry (I tried it with chicken), prawn cakes, and fish cakes. The last time I came, I saw many tables ordering Thai iced tea and it looked amazing! Next time I go, I will order myself a glass of that! Oh, and if you go for lunch, they have lunch specials and they serve it with a really tasty springroll. This is probably the largest single portion of a spring roll I’ve had in a restaurant. 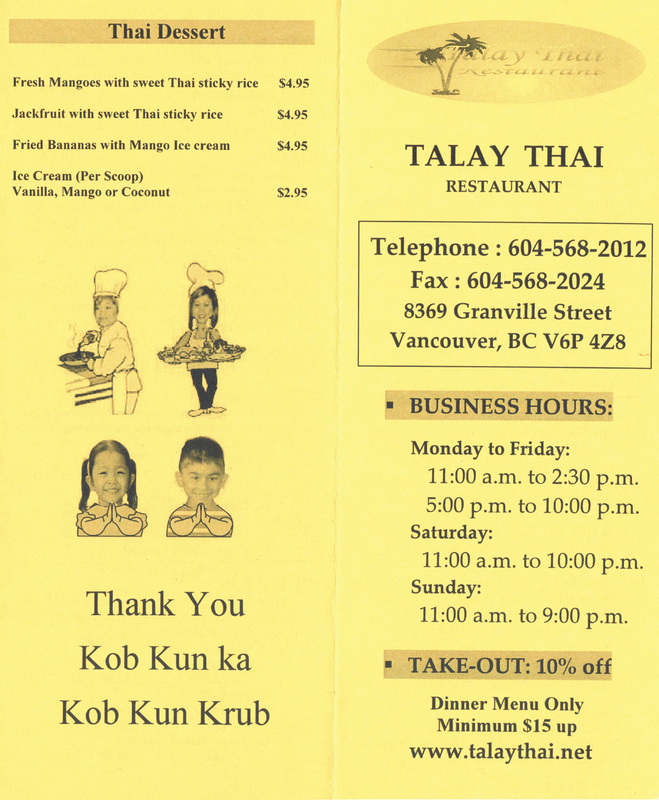 Talay Thai is nearby and we had not done enough Thai dine outs lately. So we thought this would be great to check out Jaime’s recommendation. 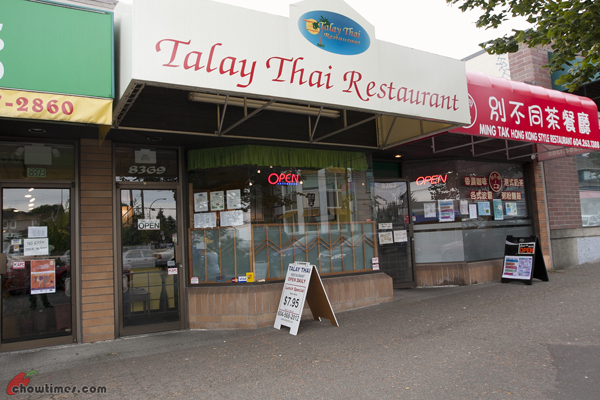 Talay Thai is located on the southern end of Granville, near the intersection with 68th Ave. It was just next door to the Ming Tak HK Style Restaurant which we had blogged before (see link here). As we walked into the restaurant, there was a sign extolling the fact that they serve authentic and traditional Thai food. It also said that it is operated by two Thai women, Dtua and Dtoon and they hail from the Chalnat Province (central Thailand, north of Bangkok). The service is very good. It is very typical of Thai hospitality. The waitress was very polite, soft spoken and have a charming smile. And very pretty too. Actually she was the second most prettiest woman in the restaurant that time we were there. The inside of the restaurant was pretty cozy. They have booths. Some big, some smaller ones. The bigger ones are configurable too. 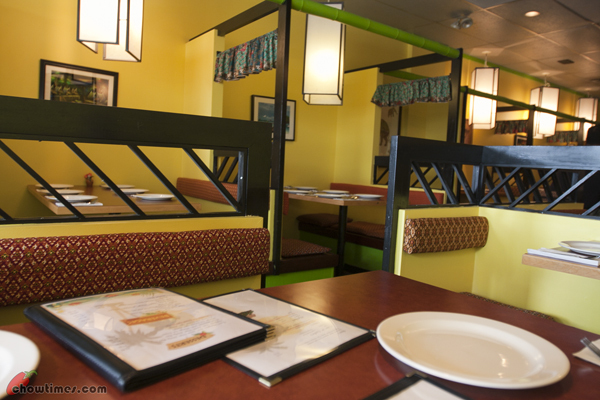 The seats are wooden benches with thrown pillow — much like those you see in Korean restaurants. The (2nd prettiest) waitress told us that the word Talay means “sea” on the Thai language. So dishes with the word Talay means mixed seafood. 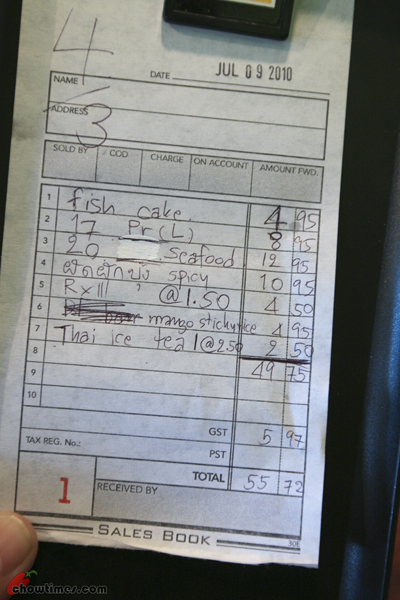 In Talay Thai, I guess you got to pay $2 more for a Talay version. First thing first. 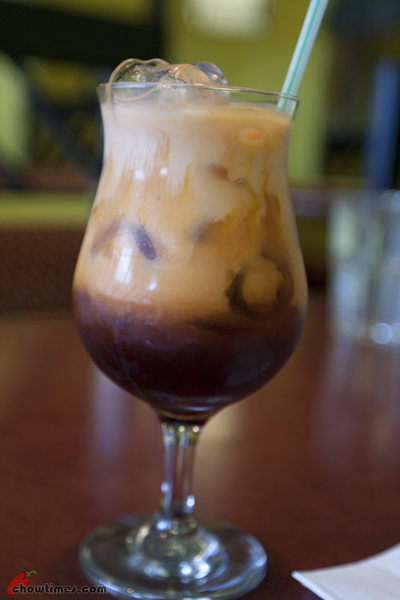 We order the Thai Iced Tea ($2.50) that Jaime was talking about. It was pretty unique and we enjoyed it. It is made with red tea with milk and served unstirred. It does make it look a lot more appealing. After stirring, it turned orangey. Good drink. Good recommendation, Jaime. 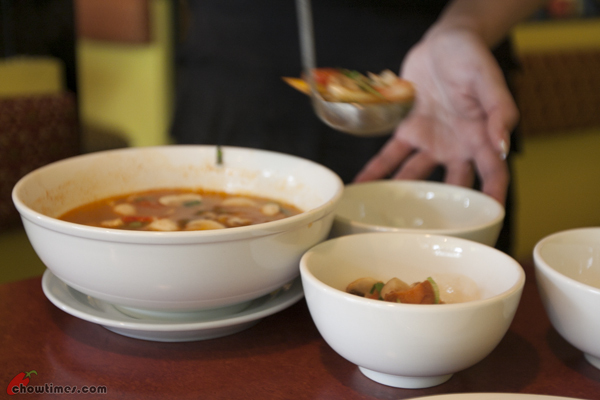 For starters we ordered the Tom Yum Soup and opted for the prawn version which is $9. 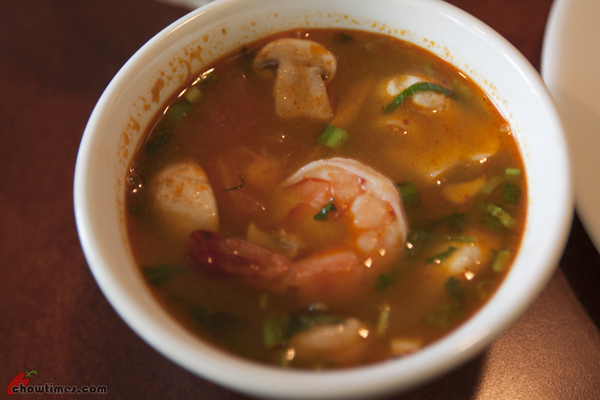 I don’t know … I always order tom yum with prawns. That is my favourite version. The soup was good — sourish and savory. This hot and sour soup has in it mushroom, lemon grass, tomatoes, lime leaves, green onions and cilantro. The only thing is that it is … not spicy enough. It would be wonderful if they put in some birds eye chilli! Nazaroo likes it too. He ate everything … everything except for the mushroom. He left those for the prettiest woman in the restaurant that day. The Homemade Fish Cake was one of the recommendations from Jaime. This is called Tod Mun Pla and is $5. While this is tasty, it is kind of small. I just wished that there are more to it. But OK, I know … I know some of you are gonna say that this is an appy. Still. It is served with homemade plum sauce which has onion, garlic, cucumber and carrot. I like the sauce. Oh … it is also topped with deep fried basil … nice. I thought I heard the waitress emphasizing the word “homemade” several times. Jaime also mentioned that the green curry was good. So OK, we ordered that too and we chooses the “Talay” version. Known as Kaeng Khiew Waan on the menu, this is $13. They describe this dish as a wonderful green curry in coconut milk with egg plant, bell peppers, fresh basil and lime leaves and your choice of meat. Sounds good right? Well, it tasted sweet and salty. In fact it was too sweet for my palate. I mean, I just expect curry to be hot and spicy but this is just too sweet. The curry was just too coconutish and creamy. Suanne thought it was OK. To each their own. Nanzaro just refused to try this. When we asked him why, he said that it is just like salad with too much dressing! LOL! Sometimes I don’t know what goes on in his mind. The “Talay” here included scallop, squid, prawn, mussel, deep fried fish or some kind of dried fish (texture very firm). The dried fish was quite nice and we were wondering if we could buy this from the Asian grocery stores. It would be great with making soup at home. The waitress recommended that we get the special of the day, Ung Choi. He he he … we know why this is special for the day. We were just out shopping earlier in Parker Place and we found that the water spinach is really cheap that day. Still we ordered that. 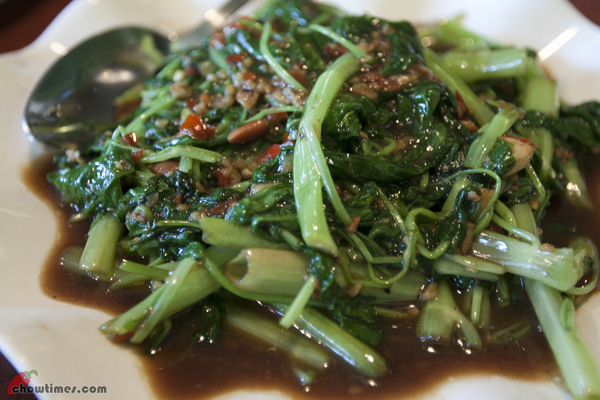 It was nice … spicy and lightly sweet flavour with salty soy bean … just perfect with rice. 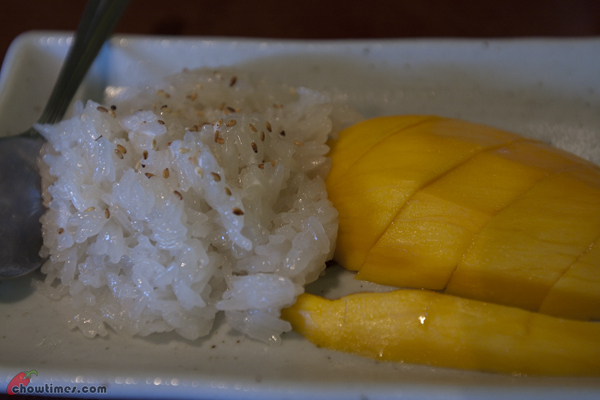 For dessert we wanted to try the Fresh Mango with Sweet Sticky Rice ($5). 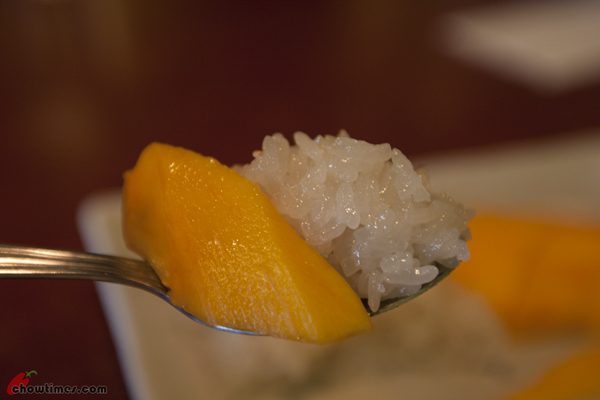 It had been a long while since we tried really good mango with sticky rice. This is lovely and very well executed. My complain (again) is that it is such a small serving and we shared it. So you imagine that we each only got a couple of small spoonful. The sticky rice cooked in sweetened coconut milk is served warm. The mango slices were ripe and sweet and served cold. It was a good example in the contrast of temperature, texture and taste. Everyone would love it … except for Nanzaro who again refused to try this. I don’t even want to ask him anymore what is wrong this time. I am fine since the serving is so small anyway. The food here is kind of expensive. OK, I should say it is kind of expensive for a family dine out but it should be OK for a couple dine out. The food was OK except for the green curry which I personally think should not be so sweet. Thanks for the heads up about this resto. 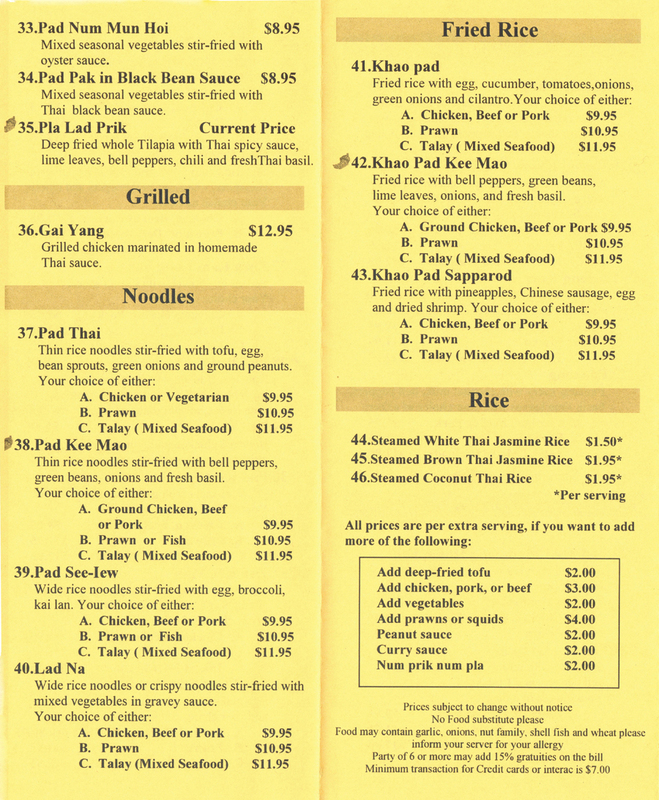 Like others I am always looking for a new Thai place to try and this one is reasonably close to us also. Menu looks pretty standard, with a few of my favourites making an appearance :-). The whole sweet thing is a bit of a conundrum, from what I understand about Thai cooking (brother lived there for a while). The key is supposed to be striking a balance between salty, sweet, sour, spicey and so on. Seems to me if one of these is too overpowering, it’s not a good thing. 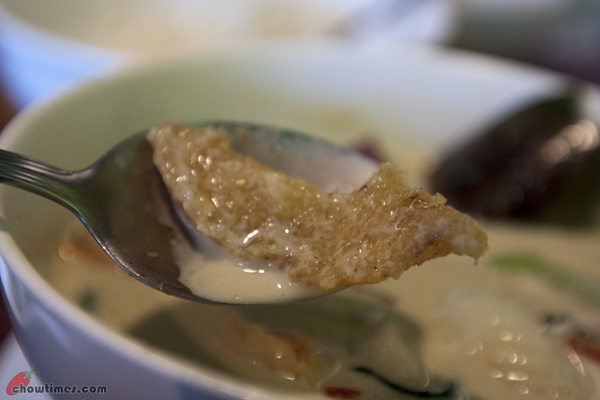 Having said that, I love curry or soup (tom kha) with tons of coconut milk and I don’t mind it a bit sweet :-). Hi Ben, does it ever make you wonder that despite having collected the HST from customers, the restaurant receipt didn’t show the HST No.? Well, my guess is perhaps lots of restaurants that use similar handwritten receipts do not report the HST they collected! I assume that the HST number is the same as the old GST number they had. Which, of course, is also not printed on the receipt. But I usually assume the opposite, that they do report all the taxes they collect. Because, at the end of the day, for most small business operators, it’s not worth it to get into trouble with the Canadian Revenue Agency. The CRA can make your existence such a misery that it is just better to comply. Yes, the nos. are the same, but regardless, it is not shown on the receipt, which should be mandatory. Needless to say, and you’ll be surprised, how many restaurant operators do think they can get away with this assuming that being small (and especially those collecting “cash” only) means the CRA will not pay much attention to them! From the write-up on the restaurant menus, seems like the owners-operators are newbies to running a business, and probably, running a business in Canada so they may not be aware of the rules and regulations. Yup — and somebody should just tell these operators to just collect the darn taxes, because it is just not worth it getting into a row with the CRA. I used to think of Thai as gentle, like you say. We had a Thai student and she was a rather prickly person, actually. You can’t overgeneralize nationality and its effect on personality is what I think after my experiences with traveling students. Thailand has been in the news a lot lately with the military given additional powers, coups, revolts and more — which don’t go along with the notion of tranquility and gentleness. Regarding curries, aren’t Thai curries generally sweet? It really is amazing how many different things are covered by the word “curry”. It’s also tailored for mainstream palates — hence, sweeter. I’ve eaten in several Thai restaurants and that has been my observation. They seem to add a bit of sweetness in their dishes. Even in stir-fried dishes. Its quite noticeable. I dont know if you guys notice that too. JS, if they want it to appeal to mainstream palates shouldnt they tone down the heat instead, no? They do tone down the heat or at least give you options for it. In general, I find the Thai food in Vancouver to be very, very toned down in flavour. I haven’t found a restaurant that I particularly like. Central Thai cooking is generally sweeter than any other parts as the blog’s owner mentioned that this resto’s owners come from central thailand then well they’d cook in their styles. There is a place in Surrey accross from Guildford Mall called Sabai Thai? Have you tried? Personally it is my favorite Thai restaurant. 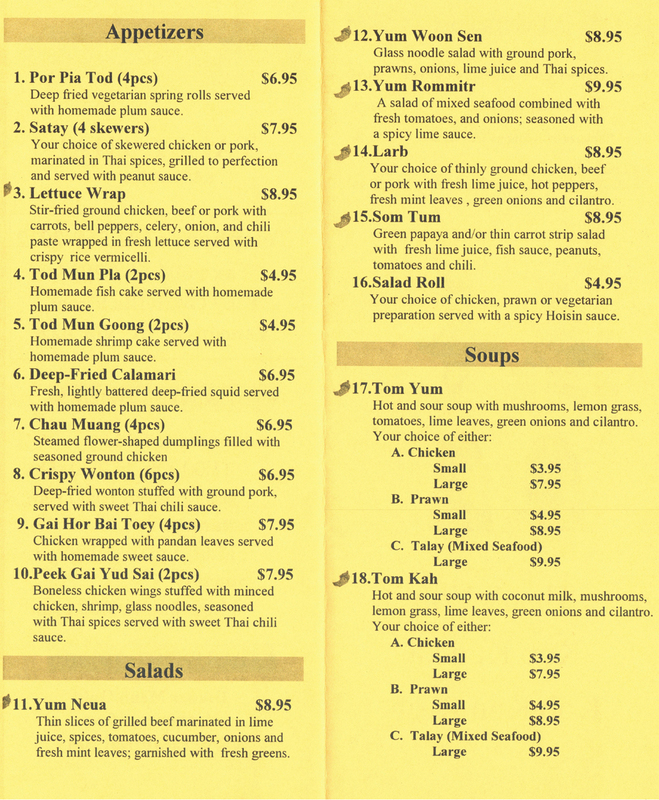 What’s your favourite Thai restaurant in Vancouver Ben in your opinion? I have been wanting to try a good Thai restaurant! That’s one thing I noticed about Thai curry. It is sweet. Sometimes overly sweet as what you had there. I’d like my curry to be more savoury with just the slightest hint of sweetness.